Our paid programs bring the “equipping” part of our mission to life. We listen hard and ask a lot of questions of Nourish Evolutionaries. And then we carefully craft programs to deliver. Our goal is to meet you where you are and give you exactly what you need to make nourishing food possible within the constraints of your real life. If you know what you want to eat, but struggle with how to make it happen, the 10-Day Reset is for you. 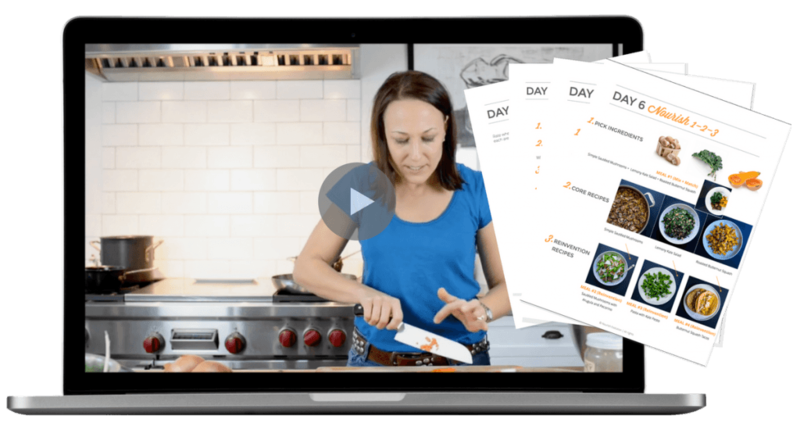 Daily videos, worksheets and recipes work together to build the skills, habits and mindset to make nourishing meals your new norm. If you’re looking for ongoing inspiration for getting more scrumptious veggies on your plate, Cook the Seasons is it. 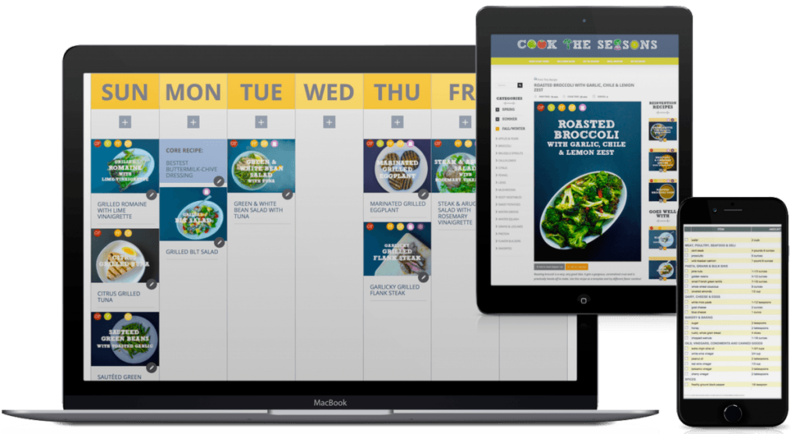 Mix and match simple “Core” recipes for your first meal, then use leftovers for easy “Reinvention” meals throughout the rest of the week. Cook the Seasons recipes work, every single time. I’m becoming a much better and more inspired cook! My husband has ogled over every single meal that I have made since starting. Delicious and healthy. This program really is the best thing out there for busy people. The recipes are terrific. You won’t regret this! This week has been so much fun! By doing 1 large meal on Monday mixing and matching Core Recipes, I’ve been able to throw meals together quickly the rest of the week. This is way too much fun! I have been so impressed at the speed I am able to put together a meal, and veggies I’d turned my nose up at the past I now love! Dinner tonight was a Reinvention made with leftovers from the last two nights, and it was SOOOOO good! And since everything was already cooked, it only took 15 minutes to pull together! I planned my menu in about 30 minutes and the grocery store was a breeze with the automated shopping list. I have not felt this together with seasonal, whole-food cooking for my family EVER. I just made my first meal with Cook the Seasons and am so hooked! My shopping bill was very reasonable, even with shopping at my local co-op and getting everything could organic. Loving all the learning. I was intimidated by fresh veggies because I had no idea how to cook with them. Now I’m buying chard, asparagus, radishes. So happy I signed up for this program! My husband, who wasn’t sure about spending the money, LOVES this. He’s liked everything we’ve made. Our grocery bill is half what it was and so is our trash! PLUS, we’ve both lost weight without dieting. I can’t say enough good things! First day using the program and it’s already saving me from having to throw stuff out. AND the recipes were delicious. It’s a winner! The reset showed me how powerful it is to be mindful about the ingredients I choose when planning meals. Each meal does not need to stand alone and create a whole new round of work to get dinner done. I had been trying to make way too many recipes each week and getting overwhelmed when I didn’t feel like cooking another meal from scratch. I love this new way of thinking and planning for the week. I LOVED cooking along with you! I learned so many little tips and knife techniques, plus just loved seeing your process and equipment. This has been the missing link for me. I love to follow recipes but have always wanted the confidence to “reinvent”. I’m already starting to take risks and make substitutions in the kitchen. And you know what? It’s turning out fabulous! This was a good way for me to get motivated to get back in the kitchen and back into the habit of eating and preparing whole foods.